Gray Davis, left, alongside his wife Cassandra, receiving the Liberty Medal from State Senator Hoylman. 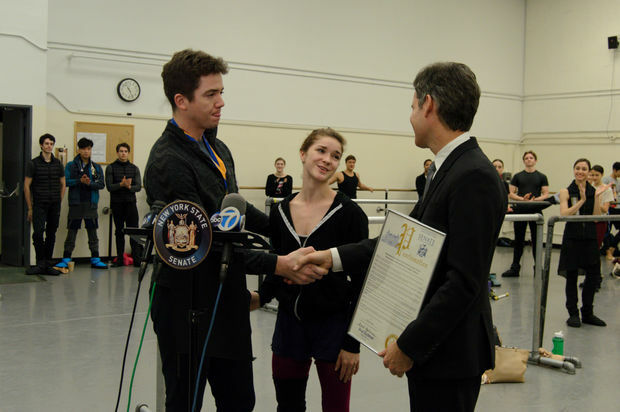 LINCOLN SQUARE — The ballet dancer who rescued a man who was pushed down onto the subway tracks this past June has been awarded the New York State Senate's highest civilian honor. At a press conference accompanying the award presentation on Wednesday morning, the dancer, Gray Davis, described how he came to save the 58-year-old victim from the downtown 1 tracks at the 72nd Street station, late on the night of June 3. "At one moment, I saw someone on the tracks unconscious," Davis, a 31-year-old dancer for the American Ballet Theatre, recalled. "After that, I think instinct took over, because I don't actually remember acting on the moment, I just happened to do it and realized what was happening after it was done." Witnesses said they saw a woman, Carolyn Mack, push the man onto the tracks after a scuffle. The victim suffered cuts to his head and was treated at St. Luke's Roosevelt Hospital, while Mack later pled guilty to first degree reckless endangerment and will serve four years in prison, according to court records. "I was really shocked but it was definitely a moment of, 'Oh that's my husband,'" said Davis' then-fiancee Cassandra, who was waiting for the train with Davis' mother, Janie Krabbe B. LeTourneau, when the incident occurred. "It happened so quickly so by the time I saw it was him, he was already climbing out of there." Davis' heroic actions earned him the Liberty Medal, the highest civilian honor that was awarded by Manhattan State Senator Brad Hoylman. "Heroes are made, not born," Hoylman said at the award presentation. "They seize a split-second moment, they embrace danger selflessly and they become role models for all of us. On that fateful evening on June 3, Gray, you were made a hero." But Davis responded that he was simply acting as a fellow human being, and that being called a hero was hard for him to hear. "My sister is a nurse, and my brother-in-law is a policeman, I consider those heroes. he said "But it is an honor to me." Davis added that he'd be going back to rehearsal right after receiving the award. "Again, nothing much has changed," he said. "I'm still in my ballet clothes and trying to get ready for the show tonight."